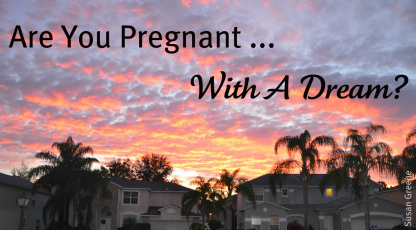 _ If I asked if you were pregnant – I’d be going out on a limb wouldn’t I? Well? What kinds of dreams has God placed in you? I know that when I was a girl, I wanted to write novels. I used to steal away long hours in my bedroom reading book after book. I loved the way a writer could take a bored teenager away from a snowy, cloudy day to another world and another place in time. _ Being a novelist made sense to me until my high school guidance counselor unwittingly squelched my dream. She was asking our class about our career goals and when she got to me, well, she gave me a big negative on my plan. I’m sure she didn’t mean it, but my guidance counselor did a horrible thing. She put my dream into dormancy. Our visiting pastor told us that God-given dreams sometimes do that. They shrivel up like a dried up seed, looking dead and forgotten. But, you know what seeds do when their nurtured right? I know you do. Some of you may be feeling like something is growing inside of you -- something good and God given. Maybe you can’t quite put your finger on it. Our visiting pastor explained this saying: “You may not even know what it is you are pregnant with, but God knows, because he is the one who put it there.” I guess in this case, it would be a good idea to seek God for his revelation. The pastor also said that birthing something takes faith and sometimes pain – just like a real birthing process. I spoke with a man recently who was laid off from his job. Instead of doing nothing, he’s started his own business doing something he’s good at. It’s risky and he knows it, but he’s going for it. God knows what kind of dreams he’s placed inside you and stepping forward in faith can be a little scary at times. _ After our church service was over, I went forward for prayer. You see, I’ve had a dream bubbling up in me for a few years now, and I guess that’s why I so connected with Sunday’s sermon. His words brought life to a dream that I thought was dead. He also said that once God reveals a dream, we must be obedient to move in that direction. So, what’s your dream? Better do some digging and see if you’ve got one growing deep inside of you. And me? Well, I guess I’d better get writing. Meanwhile, the moment we get tired in the waiting, God's Spirit is right alongside helping us along. If we don't know how or what to pray, it doesn't matter. He does our praying in and for us, making prayer out of our wordless sighs, our aching groans. He knows us far better than we know ourselves, knows our pregnant condition, and keeps us present before God. That's why we can be so sure that every detail in our lives of love for God is worked into something good. Photo courtesy of my friend and colleague Susan Greene at: www.SusanGreeneCopywriter.com.